My Journey to Fit: FMM - I Met Biz! FMM - I Met Biz! My Journey to Fit meets My Bizzy Kitchen! Biz accidentally got this burger; it wasn't what she originally ordered, but she was being nice to our frazzled waitress (and I think the chopped jalapenos didn't hurt - Biz loves spicy things). Carrot cake, chocolate cream pie, banana cream pie cake - they were all good but the chocolate pie was amazing; it had a layer of white chocolate on the bottom of the crust! First take the picture, then take the bite! Jacob and Hannah! It was so nice to meet them; I told Hannah I felt like I'd watched her grow up via her mom's blog. They were really sweet and funny. Too soon, our time was up; I sent them onto the nearby Buc-ee's for fuel and fun, and I headed back home, hoping to beat the impending storm that was predicted (I did, whew). It was so neat to finally meet Biz in person; I sincerely hope it won't be another seven years before we can hang out together again! Beautiful bouquet of flowers from Biz; what a sweet reminder of our afternoon together! Tried to get a picture showing the fit - not a great shot but I had to laugh at how Paco immediately jumped up to get in the shot..."oh, we putting our feets up on desk? Can do!" I'M READING AS FAST AS I CAN! STOP BUGGING ME!! Seriously, the pressure of these constant emails is getting to me. And it's funny, because when your check out period is done, the books just become unreadable in your device; it's not like you have to actually DO anything to return them. I don't get it. Maybe I should stick to old-fashioned books. How nice you got to meet up with Biz! I think I found your blog first and you introduced me to her through your blog roll back then. I just love Pacos personality its so funny how he always wants to photo bomb your pics! I don't keep up with current fashion so I don't know if boyfriend jeans are still a thing or not. I just wear what is comfortable and looks good on me. I like the dark wash of your jeans and the cool purple shoes! I am so happy you finally met Biz! And get a bonus to meet Hannah and Jacob. Looks like you had such a fun afternoon together. Paco is Paco, that dog makes me laugh every time, he's almost human if you ask me. I have an e-reader but I buy my ebooks. They are half the price of a real book and I read a lot of books more than once. I don't even know if my library already has e-books to loan. Have a great weekend sweety. What a great time the two of you had! I have to say I would have had to have a bite of each of those desserts - they all sound absolutely yummy! Those notification would bug the heck out of me. 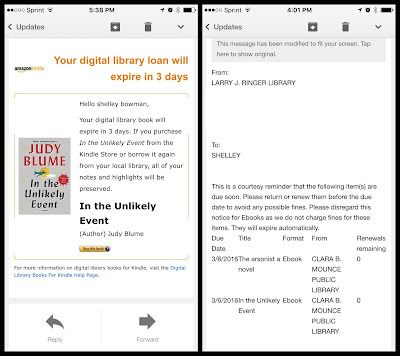 Did you know with Amazon Prime there is a Kindle Owners Lending Library where you can borrow a book a (calendar) month? You don't have to return it in a month but can't borrow a new one until you do. There is also the Kindle First thing where you sign up via email and get a choice of a free book every month. I have hardly bought any books since I discovered those two things! Paco cracks me up... and I'm coveting those hot pink shoes. The pink shoes are screaming your name - and are super comfortable! So great to meet up! I wish I lived more centrally so I could see more blog friends. I get a lot of library books on my kindle and I do the free borrows from Prime. 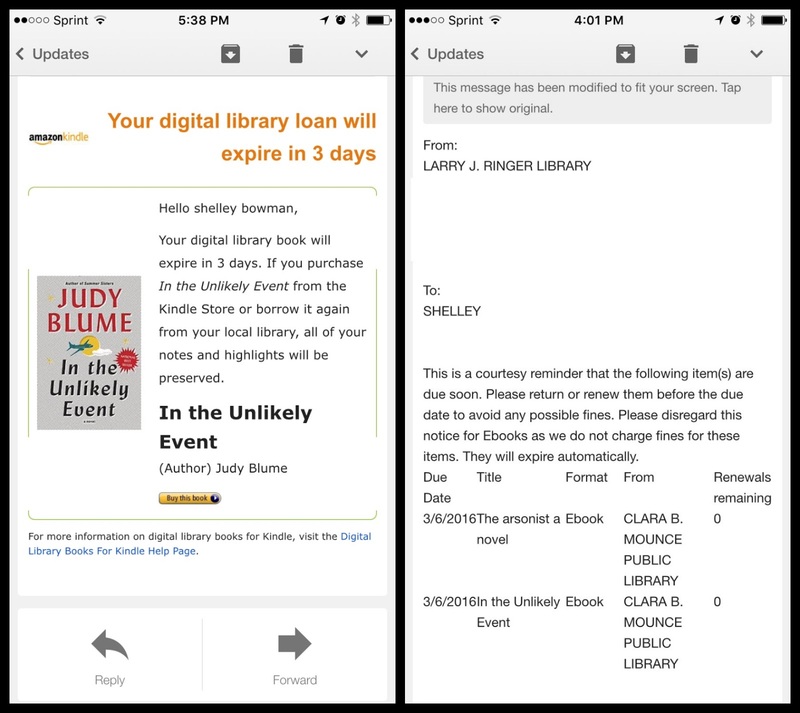 I only get notifications if a book is ready for me to check out (if it is on my hold list) or when the book is due. I never get anything from Amazon. What are boyfriend jeans? I have heard of boy cut ladies underwear, but not the jeans. 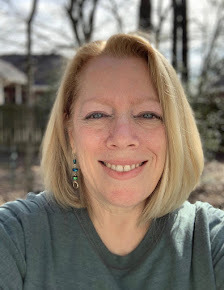 One of these days, we'll have a blogger meet up where we all can get together - it's so fun to talk in person to someone who you feel like you know, because as it turns out, you really DO know them! Boyfriend jeans are cut looser in the thigh area, which is perfect for me...plus they are supposed to be a little distressed. I like mine, but now that I've worn them several times I think I probably should have bought a smaller size as they are really loose (and no, I haven't lost that much weight, LOL). We most definitely will not wait seven more years to visit! It was so great meeting you and it is like meeting an old friend, because that's exactly what we are! Hugs! For sure, no way will another seven years go by before our next visit! That is so cool that you finally got to meet. When I meet blogger friends it feels like we've known each other forever! I was just saying how I need new jeans. Most jeans out there are super skinny jeans and I need a "boyfriend cut" Jean too! The screaming pink shoes? What? Where? I want! And so fun to hear about meeting Biz. That's a great picture of both you guys. There is a yarn store near Bastrop, but it was closed (it was their Texas weekend, according to Jacob's observation of all the small-town stores being closed on Monday and Tuesday). But yes, we will have to make a road trip to Bastrop next time you're out here. 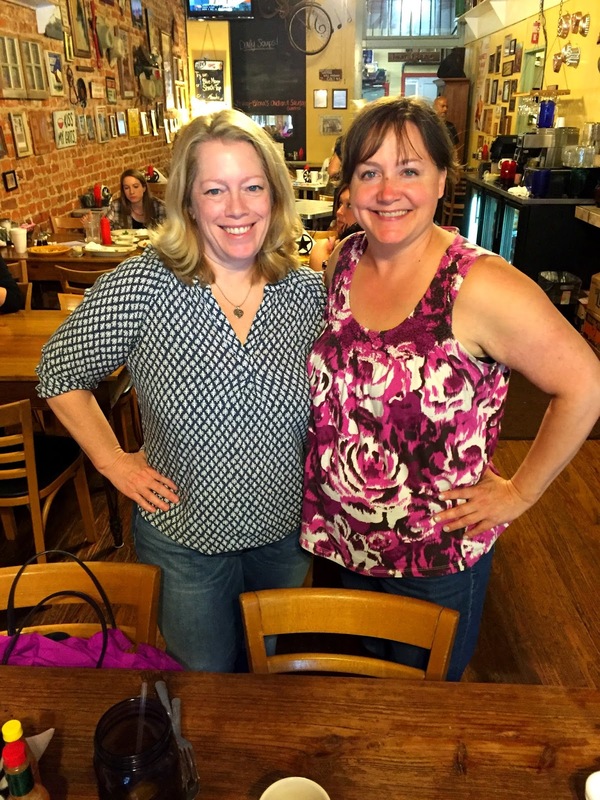 It is always fun to meet up with other bloggers! I'll be doing that this weekend. I think I gained 5 pounds just looking at those desserts. I haven't buy any boyfriends jeans. I'm so late to the party! Aww, of course Paco wants to be in the pic!!!! I'm so glad you two met!!! It looks fun!!!! !